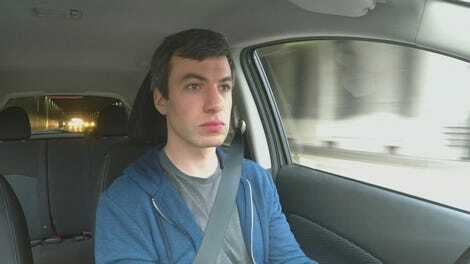 One of Nathan For You’s defining — and most enjoyable — attributes is the way Nathan is constantly piling one lie on top of another to make things work, and the fact that he usually pulls it off has given us some of the show’s most satisfying episodes. That was certainly true with “Shipping Logistics Company,” where Nathan starts with one typically absurd idea — the notion that a smoke detector could be used as a musical instrument — and got progressively more ridiculous from there. Her pessimism aside, Nathan is especially clever in this one. First, he packages the smoke detectors as “blues” smoke detectors, and hires local musician Harmonica Greg to give “instructions” on how to play them, which amount to nothing more than “just press the test button.” When a California judge tells Nathan this won’t be enough, he goes a step further, and gives us the real meat of this episode: trying to have a hit song with a smoke detector in it. He quickly assembles some musicians, and puts together a band. The musicians themselves brought some of the biggest laughs in the episode. Lead singer Yanni is incredibly earnest, although perhaps a bit airheaded, and Nathan repeatedly expresses his admiration for him. Elsewhere, guitarist Eddie is the standout of the group, so Nathan switches him to the smoke detector. Surprisingly, he takes to the role pretty quickly, only needing to be promised fame to put down his guitar. The scenes where the band — which Yanni names The Banzai Predicament — reacts to Nathan’s ideas are hilarious, particularly when he recites the lyrics to a cringe-inducing love song. It’s remarkable how much of Nathan For You’s humor comes from the fact that no one is quite willing to insult this guy to his face (although Christie came pretty close). The band’s records a single called “Orphaned Skies,” which, as far as I can tell from Yanni’s description, is about modern alienation. It has a bit of a 90s alt-pop vibe to it, like a more socially conscious Vertical Horizon. Sadly, it can’t get played on a popular LA radio station because the DJ wants to know why there’s a damn smoke detector on it. Still, Nathan is determined to make his plan work, so he takes things to another level, and things get gloriously harebrained. He decides his next best option is to get the band — and the song — on the news. So, he devises a plan to frame the Shell Oil company of using it in one of their promotional videos. Hey, if you’re looking for a corporation to drag under the bus without feeling guilty about it, they’d have to be near the top of the list, right? Nathan holds a fake Shell town meeting in Tracy, California, and brings in a fake Shell employee — who believes Nathan is actually hiring him to work for Shell — to field questions. This is where we meet Victor, who provides the episode with some of its biggest laughs. Victor is perfectly gregarious, and also incredibly ready to start doing Shell’s dirty work. The episode’s funniest moment comes when Nathan shows him a picture of an oil-drenched pelican and Victor responds by saying “it looks like he had a nice day at the beach.” He also fakes his way through the town meeting by telling people that all the waste from the oil spill had been disposed of “in a country far, far away.” Honestly, if I worked for Shell and I saw Victor, I’d be offering him a job. The dude is seriously a team player. What’s key to the story, however, is that Nathan places “Orphaned Skies” in a fake Shell video that plays at the end of the meeting. He shows it to Yanni, who is incensed, and rallies the rest of the band to stage a concert protesting Shell. They perform outside a gas station in Hollywood, and also give away truck full of free gas to motorists. Sure enough, this gets them on the news, and creates a ton of buzz for The Banzai Predicament. Sadly, this still isn’t enough to impress Christie. With no other options, Nathan simply attempts to ship the smoke detector to South America with it labelled as a musical instrument. He pulls it off, and Christie begrudgingly admits that his idea worked.. The fact that all the extra work he went to along the way was ultimately unnecessary didn’t make it any less enjoyable; rather, it’s the type of irony that makes Nathan For You so enjoyable. After a format-bender like “The Anecdote,” this week’s return to more standard fare could have been a bit of a letdown. Luckily, Nathan’s ability to pack absurd lies on top of each other and somehow not have everything blow up in his face (well, except when it does) remains an incredibly rewarding way to spend a half hour. The wait for Season 4 was brutal, but we’ve been rewarded with another round of fiendishly clever episodes. 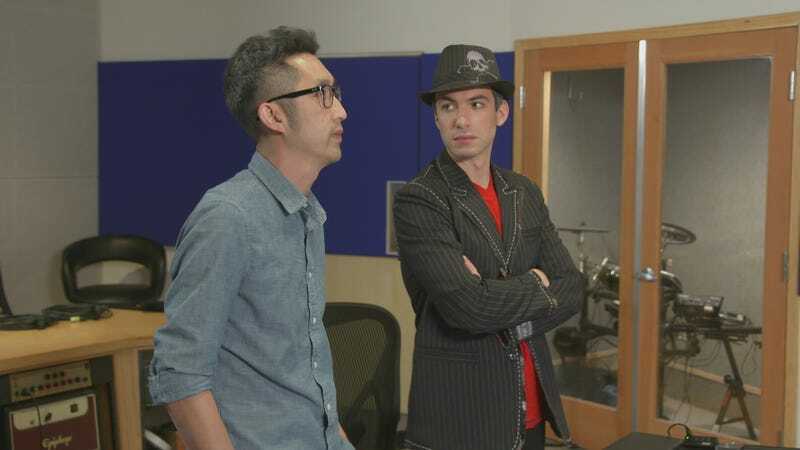 During the interview with Victor, Nathan explains away the cameras by telling him that if he’s hired, he’d be their one millionth employee. I’m actually kinda curious to see what Yanni does after this. If nothing else, he clearly has a lot of passion. Nathan For You kicks off season 4 by celebrating Nathan’s past...uh, successes?